LOGAN, Utah (AP) — A former Utah State University football player denied charges that he sexually assaulted six women while he was in college. 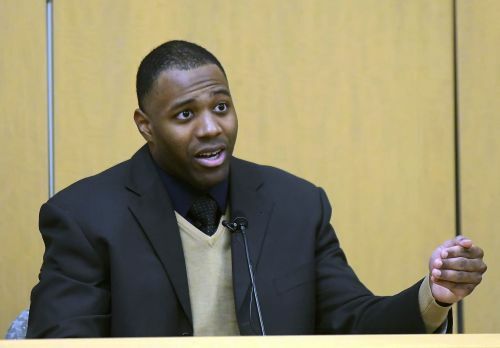 Torrey Green testified Tuesday that he wished he had told women he dated in college he wasn't interested in long-term relationships, but he insisted he did not assault them, the Salt Lake Tribune reported . He countered detailed testimony given earlier by the six women who reported they were assaulted under similar circumstances, many after meeting Green on a dating site. "I wish I didn't break their hearts. I could have done a better job of letting them know I didn't want to be in a lasting relationship, and I'm sorry for that," he said. Green's lawyer, Skye Lazaro, has argued that the women came forward after Green signed the rookie contract because they wanted attention. Police had investigated several reports of sexual assaults involving Green, but prosecutors declined charges in April 2015. The cases weren't filed until the next year. During cross-examination, Deputy Cache County Attorney Spencer Walsh questioned the detective's interactions with Green, criticizing Olsen for never getting confrontational and never asking hard questions. "Fair to say that you treated this defendant with kid gloves?" Walsh asked Olsen. "Maybe unintentionally, but that's how you treated him in the interview." "I believe so," Olsen said, noting his method of downplaying the allegation now "may come across as not giving it full attention it deserves."